Sight, the sense of vision or visual perception, describes the capability to detect electromagnetic energy within the visible range (light) by the eye, and the ability of the brain to interpret the visible light information as an image. It is one of the traditional five senses, originally described by Aristotle, along with hearing, touch, smell, and taste. 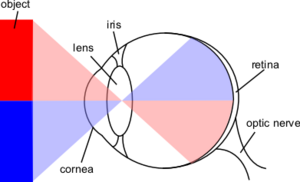 The various components involved in vision are known as the visual system. There is disagreement as to whether sight constitutes one, two, or even three distinct senses. Neuroanatomists generally regard it as two senses, given that different receptors are responsible for the perception of color (the frequency of photons of light) and brightness (amplitude/intensity—number of photons of light). Some argue that the perception of depth also constitutes a sense, but it is generally regarded that this is really a cognitive (that is, post-sensory) function of brain which interprets sensory input to derive new information. For almost all animals, sight is a fundamentally important adaptation for their individual purpose of survival and reproduction. While blind cavefish, moles, and other animals with vestigial eyes may depend on other senses, for most animals sight is integral to avoiding predators or securing food, and for some, it is is an integral sense for reproduction, such as the visual displays of a courting dance. For humans, sight is also fundamental to their internal, spiritual dimension. Sights of nature can add to one's sense of joy and help people to relate to others. Visual perception is a complex process, not easily understood, for what people report seeing is not simply a translation of retinal stimulation but involves visual processing in the brain, impacted, for example, by past experiences. Sight is a sense. Broadly defined, a sense is a mechanism or faculty by which a living organism receives information about its external or internal environment. In other words, it is an inherent capability or power to receive and process stimuli from outside and inside the body, such as the sense of hearing or sense of sight. Sight is the sense of detecting and interpreting visible light information reaching the eyes. The resulting perception is also known as eyesight, visual perception, or vision. The broad definition of sense includes both physiological methods of perception, involving reception of stimuli by sensory cells, and incorporeal methods of perception, as in spiritual senses. Throughout history, there have been many published reports of people having "spiritual senses." In this case, a spiritual sense refers to a mechanism or faculty to receive and process internal or external stimuli of an incorporeal nature. For example, there are references in sacred scripture, as well as popular books and media, to individuals who see individuals who have passed away. However, the term sense is often more narrowly defined, as related to higher animals. 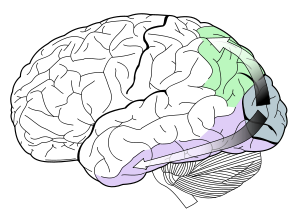 In this case, a sense is considered a system involving sensory cells that respond to a specific kind of physical energy (both internal and external stimuli), which are converted into nerve impulses that travel to the brain (either a specialized area of the brain or specialized areas), where the signals are received and analyzed. In the case of sight, this refers to the sensory cells that respond to electromagnetic radiation in the visible range. School children are routinely taught that there are five senses (sight, hearing, touch, smell, taste; a classification first devised by Aristotle), but it is generally agreed that there are at least nine different senses in humans, and depending on the chosen method of classification, as many as 21 human senses have been identified. In addition, many individuals report various spiritual senses and some individuals report synesthesia, the "crossing-over" of one sense to another, or even of senses associated with certain pure concepts. A synesthete may, for example, "see" sounds or "hear" colors. 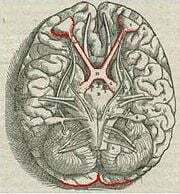 The visual system is that part of the nervous system that allows organisms to see. It interprets the information from visible light to build a representation of the world surrounding the body. The visual system has the complex task of (re)constructing a three dimensional world from a two dimensional projection of that world. The psychological manifestation of visual information is known as visual perception. The visual system allows humans to assimilate information from the environment to help guide their actions. The act of seeing starts when the lens of the eye focuses an image of the outside world onto a light-sensitive membrane in the back of the eye, called the retina. The retina is actually part of the brain that is isolated to serve as a transducer for the conversion of patterns of light into neuronal signals. The lens of the eye focuses light on the photoreceptive cells of the retina, which detect the photons of light and respond by producing neural impulses. These signals are processed in a hierarchical fashion by different parts of the brain, from the retina to the lateral geniculate nucleus, to the primary and secondary visual cortex of the brain. Different species are able to see different parts of the light spectrum; for example, bees can see into the ultraviolet (Bellingham et al. 1997), while pit vipers can accurately target prey with their infrared imaging sensors (Safer and Grace 2004). The major problem in visual perception is that what people see is not simply a translation of retinal stimuli (i.e., the image on the retina). Thus, people interested in perception have long struggled to explain what visual processing does to create what one actually sees. There were two major Grecian schools, providing a primitive explanation of how vision is carried out in the body. The first was the "emission theory," which maintained that vision occurs when rays emanate from the eyes and are intercepted by visual objects. If one saw an object directly it was by "means of rays" coming out of the eyes and again falling on the object. A refracted image was, however, seen by "means of rays" as well, which came out of the eyes, traversed through the air, and after refraction, fell on the visible object, which was sighted as the result of the movement of the rays from the eye. Although this theory was championed by scholars like Euclid and Ptolemy and their followers, it was believed by Descartes. The second school advocated the so called the "intromission" approach, which sees vision as coming from something entering the eyes representative of the object. With its main propagators Aristotle, Galen, and their followers, this theory seems to have touched a little on what vision really is, but remained only a speculation lacking any experimental foundation. The breakthrough came with Ibn al-Haytham (Alhacen), the "father of optics," who pioneered the scientific study of the psychology of visual perception in his influential, Book of Optics, in the 1000s, being the first scientist to argue that vision occurs in the brain, rather than the eyes. He pointed out that personal experience has an effect on what people see and how they see, and that vision and perception are subjective. He explained possible errors in vision in detail, and as an example, describes how a small child with less experience may have more difficulty interpreting what he/she sees. He also gives an example of an adult that can make mistakes in vision because of how one's experience suggests that he/she is seeing one thing, when he/she is really seeing something else (Steffens 2006)). Ibn al-Haytham's investigations and experiments on visual perception also included sensation, variations in sensitivity, sensation of touch, perception of colors, perception of darkness, the psychological explanation of the moon illusion, and binocular vision (Howard 1996; Khaleefa 1999). Hermann von Helmholtz is often credited with the first study of visual perception in modern times. Helmholtz held vision to be a form of unconscious inference: Vision is a matter of deriving a probable interpretation for incomplete data. Inference requires prior assumptions about the world. Two well-known assumptions that are made in processing visual information are that light comes from above, and that objects are viewed from above and not below. The study of visual illusions (cases when the inference process goes wrong) has yielded much insight into what sort of assumptions the visual system makes. The unconscious inference hypothesis has recently been revived in so-called Bayesian studies of visual perception. Proponents of this approach consider that the visual system performs some form of Bayesian inference to derive a perception from sensory data. Models based on this idea have been used to describe various visual subsystems, such as the perception of motion or the perception of depth (Mamassian et al. 2002; Purves 2005). The Gestalt Laws of Organization have guided the study of how people perceive visual components as organized patterns or wholes, instead of many different parts. Gestalt is a German word that translates to "configuration or pattern." According to this theory, there are six main factors that determine how humans group things according to visual perception: Proximity, similarity, closure, symmetry, common fate, and continuity. The major problem with the Gestalt laws (and the Gestalt school generally) is that they are descriptive not explanatory. For example, one cannot explain how humans see continuous contours by simply stating that the brain "prefers good continuity." Computational models of vision have had more success in explaining visual phenomena (Dakin 2007) and have largely superseded Gestalt theory. Bellingham, J., S. E. Wilkie, A. G. Morris, J. K. Bowmaker, and D. M. Hunt. 1997. Characterisation of the ultraviolet-sensitive opsin gene in the honey bee, Apis mellifera. European Journal of Biochemistry 243: 775-781. Dakin, S. 2007. Computational models of contour integration. University College London. Retrieved December 7, 2007. Howard, I. 1996. Alhazen's neglected discoveries of visual phenomena. Perception 25: 1203-1217. Khaleefa, O. 1999. Who is the founder of psychophysics and experimental psychology? American Journal of Islamic Social Sciences 16(2). Purves, D. 2005. A primer on probabilistic approaches to visual perception. Center for Cognitive Neuroscience, Duke University. Retrieved December 7, 2007. Safer, A. B. and M. S. Grace. 2004. Infrared imaging in vipers: Differential responses of crotaline and viperine snakes to paired thermal targets. Behav Brain Res. 154(1):55-61. Empiristic theory of visual gestalt perception. Summary of Kosslyn et al. 's theory of high-level vision. The Organization of the Retina and Visual System. Retrieved December 7, 2007. This page was last modified on 17 September 2015, at 16:57.